In synthetic biology the control of transcription and translation is of enormous importance. Therefore, promoters and ribosome binding sites (RBS) play a central role in each iGEM project. Choosing the optimal promoter and RBS combination for a gene of interest can be crucial, since small changes in the protein expression level can lead to large changes in the resulting effect inside synthetic gene circuits. To address the challenge of choosing the right promoter, we designed a promoter-RBS library as this year’s parts collection as well as a suitable measurement system to analyze the expression strength of the chosen promoter-RBS combination. With our measurement vector the library could be easily expanded by future iGEM teams and the results are comparable due to normalization of the measured signal to a second reporter protein. We submitted our designed vector (BBa_K2638560) to assess the promoter-RBS combination expression strength accurately, based on two reporter genes. Our collection contains a variety of iGEM standard promoters like the Anderson promoter library, as well as inducible promoters. This collection is integrated in our whole project. We tested all of our promoter-RBS combinations which are important for different parts of our project. By combining different RBS and promoters, the individual strength of the RBS and promoter parts can be checked, too. With our part collection we improved our Anderson promoter library, which offers the probability to choose the strength of a knock-down using a specific promoter. Furthermore, we used the promoter-RBS combination measurement to determine the optimal expression level of our membrane proteins and our anti-toxicity project.. To sum up, we analyzed 26 promoter-RBS combinations, modeled 37 more and therefore provided the iGEM community with detailed information regarding their future projects. In addition, we designed a database that allows us to easily find a promoter or promoter-RBS combination. If you want to express a slightly toxic protein, for example, you can find a weak combination. If you are looking for a suitable expression system for your reporter gene, you can choose the optimal strength with the help of our data. For the modeling of our promoter-RBS combinations we used the given strengths of the Anderson promoters BBa_J23119, BBa_J23100 to BBa_J23110) and the strengths of different RBS (BBa_J61100, BBa_B0030, BBa_B0031) to determine an estimate for their absolute strength. Prior to the experimental validation, we modeled the expression strength of different promoter and RBS combinations to create a database for our further experiments. Therefore, we used the given strength of the Anderson promoters and the strength of the different known RBS to determine and visualize their absolute strength shown in Figure 2. Especially for our siRNA system, it was interesting to see the differences between inducible and constitutive promoters. 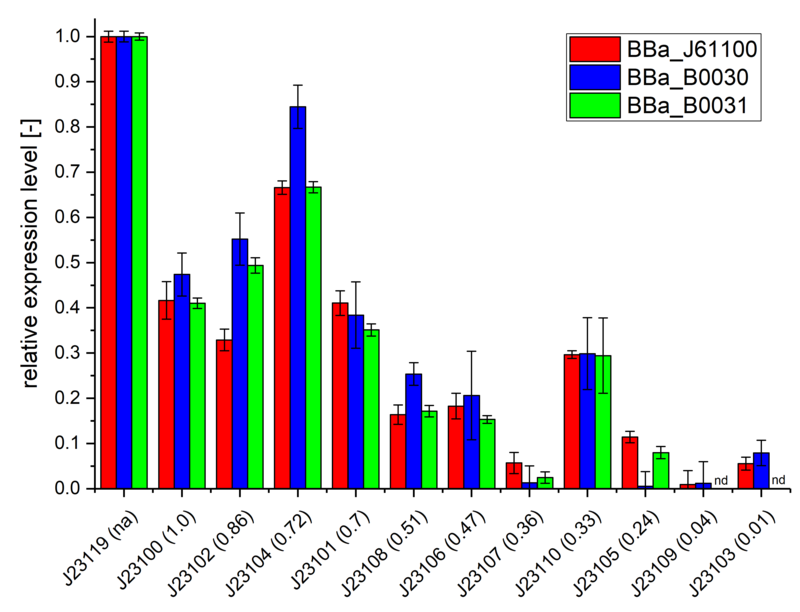 Figure 2: Modeling of the expression strength different the Anderson promoters (BBa_J23119,BBa_J23100 to BBa_J23110) in combination with three different RBS (BBa_J61100, BBa_B0030, BBa_B0031) respectively. The visualization of the modeled expression strength is shown in Figure 2. The expression is influenced by the different used RBS, which are indicated with different colors. The modeling shows a significant influence of the different RBS on the expression strength, independent from the use of different promoters. In theory, the RBS has a stronger influence of the expression strength, than the promoter, which only influences the transcription, while the RBS influences the translation. When the J61100 RBS is used, the expression strength of the construct is statistically larger (approximately eight times higher) than in the other modeled RBS. The modeling shows a relatively small influence on the expression strength whether the RBS B0030 or B0031 is used. 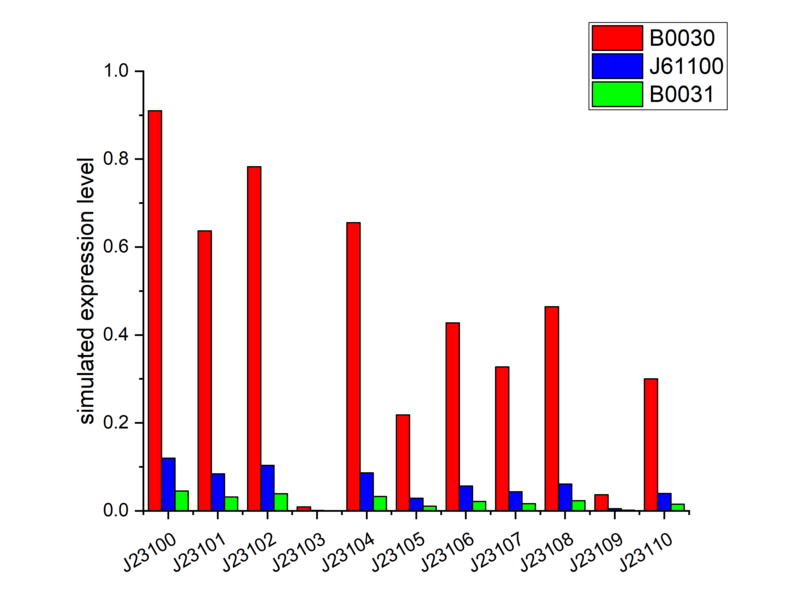 Figure 3: Results of the expression strength analysis of different Anderson promoters (BBa_J23119, and BBa_J23100 to BBa_J23110) in combination with different RBS (BBa_J61100, BBa_B0030, BBa_B0031). The plasmid BBa_K2638560 was used for the expression of the fluorescence protein mRFP under the control of the mentioned promoter-RBS combinations. The fluorescence signals were normalized to the fluorescence of eCFP of the corresponding cells. The measured values were also normalized to the measured OD600. The relative strength regarding the the E. coliconsensus promoter BBa_J23119 is shown. The known promoter strength of the Anderson collection is listed in brackets.